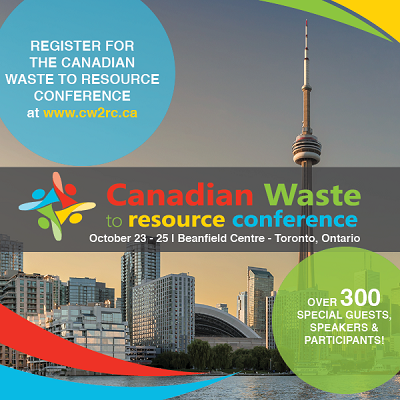 Toronto, ON (October 11, 2018) – The Ontario Waste Management Association, (OWMA), is holding their 9th annual conference, the Canadian Waste to Resource Conference, (CWRC), October 23rd -25th at the Beanfield Centre in Toronto, Ontario. The event brings together business, industry, municipalities and governments from all levels. This is Canada’s waste management sectors national forum for sector leaders to discuss new ideas, share knowledge and continue the development of a national voice. Attendees will have the opportunity to hear the Honourable Rod Phillips, Ontario Minister of the Environment, Conservation & Parks discuss the priorities of the Doug Ford Progressive Conservative government, and outlining his objectives for the Ministry of the Environment, Parks and Conservation. This year’s conference focuses on Organics, Green Energy, Recycling, Operations/Waste Disposal and New Technologies. The conference is being held in conjunction with the Waste & Recycling Expo Canada. Free passes to the Canada’s Waste and Recycling Expo will be provided to all registered conference attendees. The full program and more information around the conference can be viewed here. Additional information on the Ontario Waste Management Association can be found online here. The Canadian Waste to Resource Conference is proud to be part of the support for the Kelly Shires Breast Cancer Foundation through the Waste & Recycling Expo Canada. The OWMA is the province’s largest, most effective environmental services association representing the waste management and recycling sector. Its membership includes more than 250 companies and organizations in the private and public sectors, which manage 85% of Ontario’s waste.